Eating fish you would think would be a wonderful way to consume your protein. 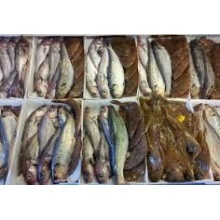 Fish is deemed as healthy and is also recommended by the Department of Health to eat fish at least three times per week. Fish has many other benefits, but that is for another blog. Fish consumption is on the increase together with other seafood, fish allergy is on the rise and affects up to 4% of the world population. It is more common amongst adults than children and can be a long-lasting condition. People who are allergic to fish can often consume shellfish with no side effects because shellfish are biologically different to fish. Many fish allergy sufferer's cannot even touch fish or breath in vapour as fish is cooking, as this will cause an anaphylaxis reaction. A person who sufferers from a fish allergy, their immune system reacts with the protein present in fish and releases a chemical called histamine into the body. According to the experts at Food Allergy Research and Education (FARE), to prevent a fish allergy reaction, sufferers should avoid fish and fish-related products completely. Watch out for hidden fish in processed foods. Before consuming any kind of food, check the label for warnings such as 'processed in a facility that also processes fish', contains fish, etc. Cross-contamination with other foods is very common in restaurants, especially in seafood restaurants. This may happen due to staff using the same utensils such as cutting boards, knives, etc. for preparing both fish and other food. Let us look at Worcestershire sauce more closely it usually contains anchovies. Therefore Worcestershire sauce would not be suitable for a person who has a fish allergy. barbecue sauce may also include fish. In addition, fish is also used for flavouring in a wide variety of prepared foods. While eating any foods prepared outside the home, it is always a good idea to ask how the foods are cooked and exactly what ingredients have been used. Make the waiting staff aware that you have a 'fish allergy' and ask which dishes would be suitable for you to eat.